Fats, oils and grease (FOG) are primarily generated by restaurants and other food service establishments. FOG is a major contributor to municipal wastewater (sewer) collection system blockages and backups. The USEPA estimates that FOG causes just over 50% of all sanitary sewer overflows (SSO). Municipalities that collect overflow data have reported FOG to be the cause of as much as 70%, and in one case 90%, of SSOs. FOG can be technically defined as organic polar compounds derived from plant or animal sources, composed of long-chain triglycerides of three fatty acid molecules bonded to one glycerol. They are lighter than water (8.34 lbs. per gal. ), ranging from cocoa butter (8.04 lbs. per gal.) to beef tallow (7.23 lbs. per gal.). This makes FOG buoyant in water given enough time to separate and rise to the surface. FOG adversely impacts on the approximately 19,500 wastewater collection systems across the country. These systems have a total infrastructure value exceeded only by transportation. Wastewater systems need to handle 50 billion gallons of wastewater daily and by some estimates 75% of sewer systems can only handle half their capacity due to clogging from FOG. 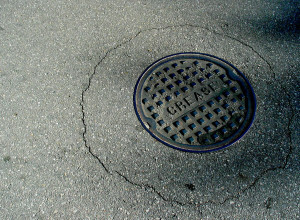 Ratepayer and taxpayer cost to keep sewers open is around $25 billion dollars annually.